We weren’t a family that had sweets on-hand very often. Cereal couldn’t have sugar as either of the first two ingredients listed; cookies and ice cream did not make regular appearances; dessert after dinner wasn’t really a feature. But when there were sweets, we went all out — perhaps that’s why desserts from my childhood are captured so vividly in my memory. The usual suspects of Pumpkin Pie and cookies through the holiday season. Piping hot triangle-shaped doughnuts on Thanksgiving morning. Sticky diamonds of baklava at Christmas. And an absolutely perfect chocolate cake that mom made every birthday from the time I was two until I moved out of home. It so defined family celebrations that it was a given at my US wedding reception and, by request of his future wife, made an appearance at baby-bro’s big day too. If there was an event or a party the big guns came out in the form of classic Baked Cheesecake. The recipe made enough batter for two enormous cakes or about a thousand little bitty fruit-topped ones. But one of the first multi-step desserts I remember making myself was Lemon Meringue Pie. The recipe was from mom’s old BH&G cookbook (the same one responsible for that insane Cheesecake) and between the pre-baked crust, stove-top custard and classic meringue, I managed to use nearly every dish and pot in the kitchen. Decades later that pie still sticks with me — not only was it was miles high, tangy and creamy, but I made it all on my own. I don’t think there will be any complaints if this dessert shows up at the next family gathering. What may appear as a complicated recipe at first is simply a combination of three very easy ones. 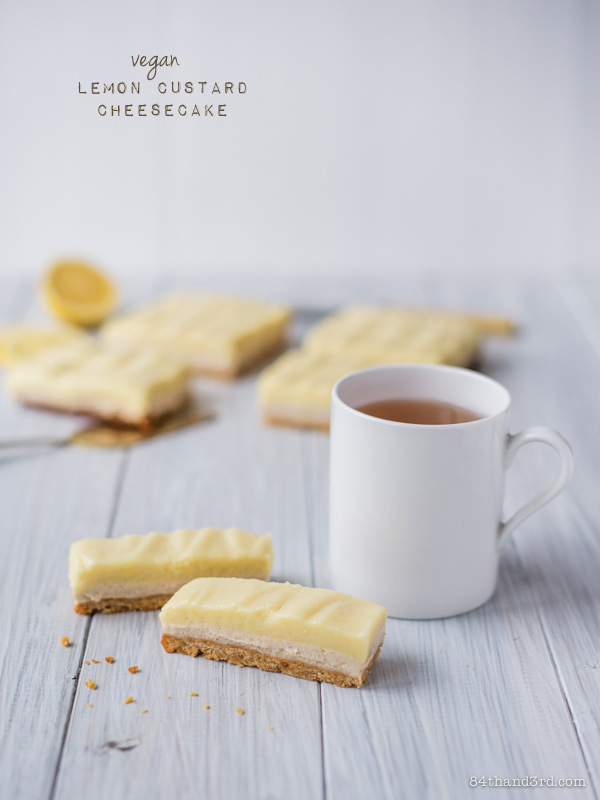 You would be forgiven if you made just one part and ate it on it’s own — but the combination of the base, cheesecake and custard are simply magic together and worth the wait! Preheat oven to 180°C (350°F). Lightly grease a 20 cm (8 inch) tin with coconut oil and line base and sides with baking paper. Make one batch of Gluten-Free Quinoa Pie Crust, press gently into the base of prepared tin then refrigerate for 10 minutes. Bake 15 mins until lightly golden and allow to cool completely. Cover dates with the boiling water, set aside to soak for 5 mins. Blend cashews until a paste forms. Add dates and soaking liquid and blend until well incorporated. Add lemon juice, vanilla and salt and blend well. Blend in coconut oil until very smooth. 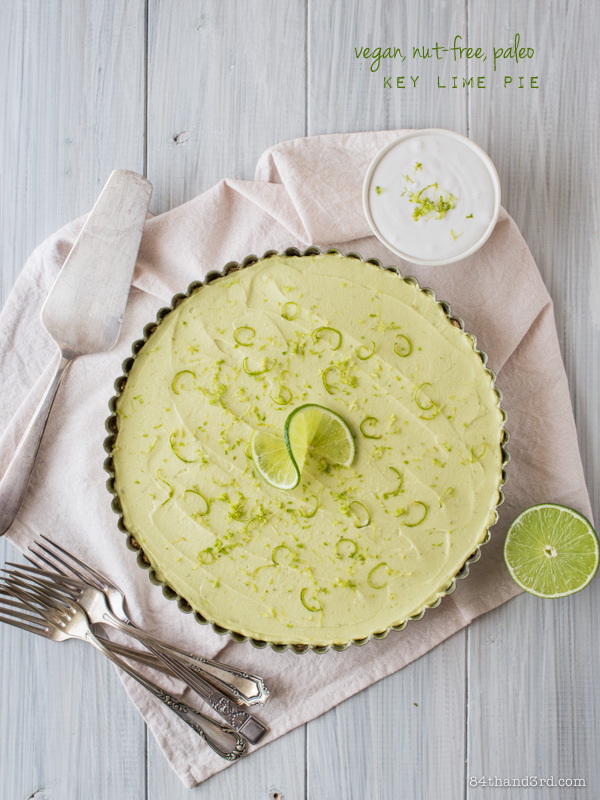 Spoon onto cooled crust, smooth top and refrigerate while you make the lemon custard. Puree cauliflower mash and lemon juice until very smooth. Blend in syrup and salt. Blend in coconut oil until well combined. Add more lemon juice or sweetener to taste. For a more yellow colour stir through a pinch or two of turmeric powder. Pour over cheesecake filling and smooth top. Refrigerate at least 4 hours. Use baking paper to lift out of pan, slice and serve. Pan: a removable base is best but I used a standard square cake tin and lifted the slice out without issue. Use square or round dependant on how you want to serve the final product. Base: you can also use a Raw Macadamia Salted Caramel Pie Crust or any other pressed-based crust you prefer. Cauliflower: break half of a large head into floretts and steam for about 25 mins until very soft. Mash well and measure out 1 cup for the lemon custard. Eat the rest for dinner, or lunch, or breakfast, or use it to make a Cinnamon Cauliflower Coffee Cake, whatever. 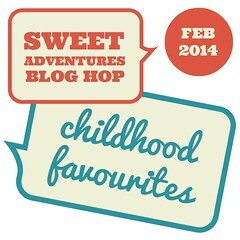 Once again it’s time for Sweet Adventures Blog Hop and our guest hostess is the lovely Sophie from The Sticky and Sweet. Thanks for hosting! SABH is a monthly blog hop brought to you by JJ from 84th & 3rd and guest hostesses. Make sure to check out all the other creations that have been linked-up below. 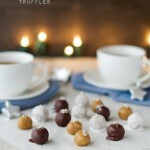 Salted Caramel Truffles - Raw, vegan and impossibly good. Thanks for the memories….and new ideas. Wow these look so good . I really wish I could try them because the ingredients are just so unusual. You make some amazing things JJ. What would you replace the dates with? I never know what to use instead as I cannot have dried fruit due to me blasted fructose malabsorption. Any sugar substitute that you can have would be fine, just add it to taste! The only non-fructose one I use is rice syrup, if you add more than a few Tbsp of it I’d up the coconut oil a touch to account for the extra liquid (the coconut oil is what makes it firm up in the fridge) but a granulated stevia-based product (or simply stevia drops) shouldn’t change the consistency at all! 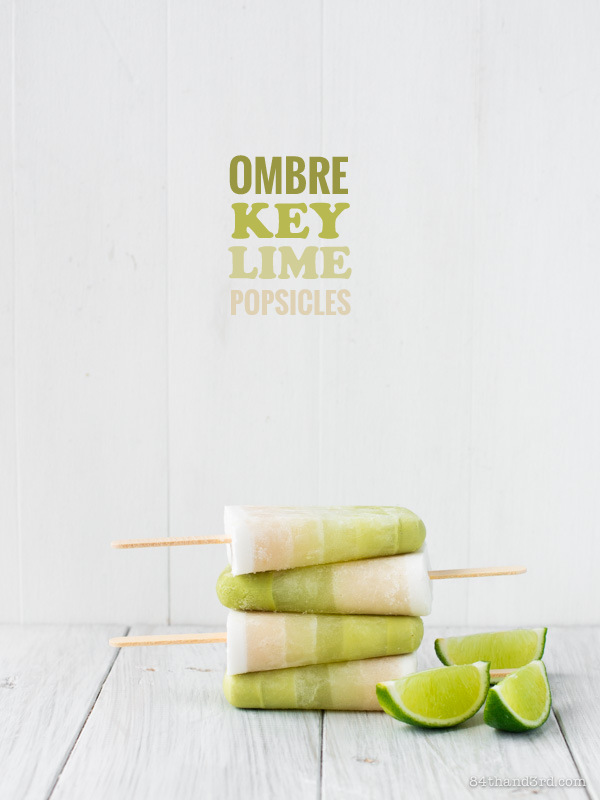 Who knew sweet treats could be so healthy? I bet kids wouldn’t turn their little noses up and these citrus goodies. 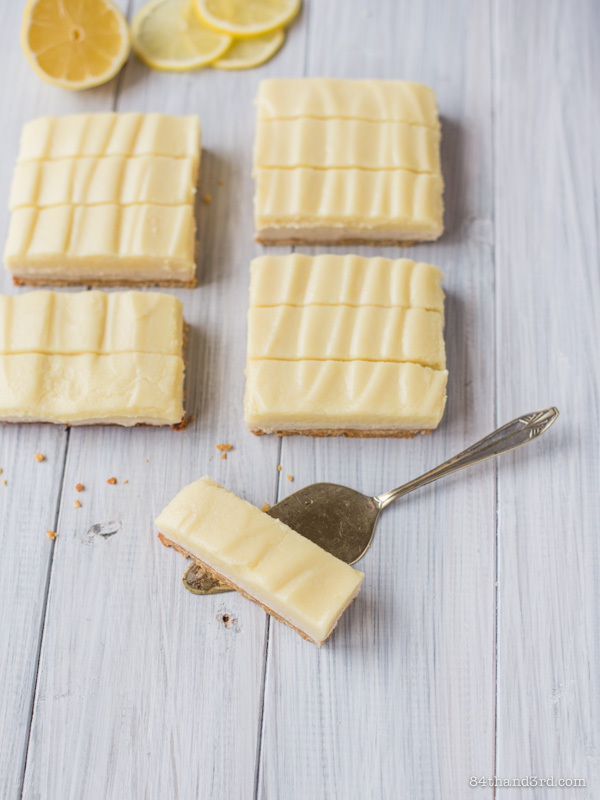 Those lemon bars look simply perfect! Love it. I love lemon bars, the layers here look irresistible! 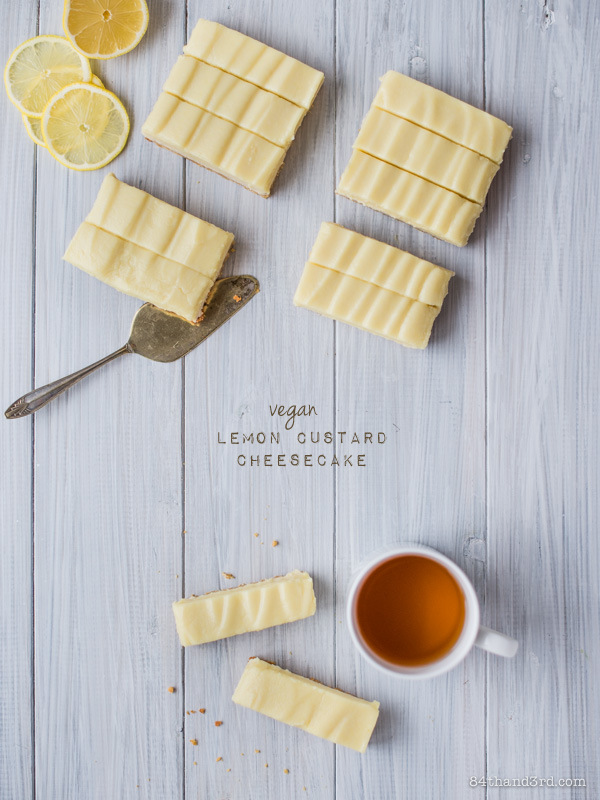 Vegan Lemon Custard Cheesecake looks yummy. It makes me droll.lol… Nice procedure to follow I will also bake this during my work break. these look gorgeous, I’m a bit scared of the cauliflower though! These look amazing JJ! So creamy and moreish (I’m much more of a citrus than chocolate fan, yes really!). Love this! Pinning. Not sure you have sold me on the use of cauli in the custard, but I suppose I will just have to give it a go and try. Actually it is Paul’s fave veg, this recipe is almost too irresistible to make for him. 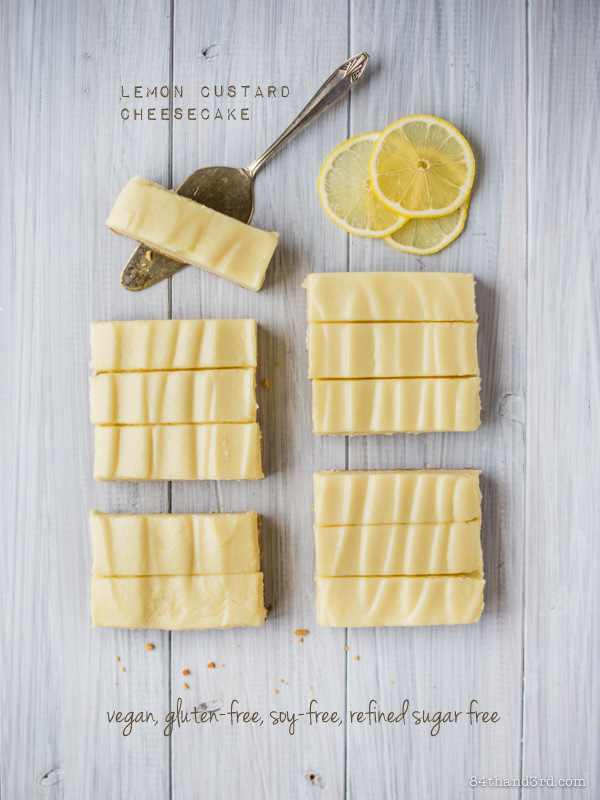 Love the memories…and the lemon squares look terrific. These look so good! I’m very excited to try the recipe out, especially since my non-vegan sister is coming over and she has a MAJOR sweet tooth! Maybe these will help persuade her to go veg. Anyways, is there a way to substitute the cashews for allergy purposes? I made they yesterday and they are amazing! I shared them with some co-workers and even the people who thought they would hate them, because I had said that it was vegan, said it tasted amazing. Next time I make it, I will use the Macadamia nut crust. nom nom nom. Hi Rebecca, you could try this carrot cake – http://84thand3rd.com/gluten-free-carrot-cake/. Replacing the almond meal with more buckwheat (but that may taste a bit strong) or teff or quinoa flour, and the eggs with 1/4 c water + 1 Tbsp chia seeds mixed into a gel for each egg (or powdered egg replacer or psylum husk mixed with the water instead of the chia). 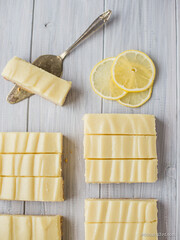 Then frost it with the lemon layer from this recipe. I’d recommend resting the cakes in the fridge overnight before assembling to give them a bit of extra stability without the eggs. Hello, i tried making the lemon custard filling and wanted to use it as a frosting, but it turned out to be very liquid-y as a frosting, any ideas on how to thicken it up? It tastes great btw! Hi Iras, Did you follow the recipe above as written or did you make ingredient or quantity changes to it? If there weren’t any changes did you refrigerate the custard or are you trying to use it right after blending? The custard needs to be refrigerated to firm up per the instructions (then it slices cleanly as seen in the photos). To use as a frosting I’d suggest refrigerating at least 4 hours then beating it very briefly to loosen, and using from there to frost your cake! Remember to refrigerate the cake until nearly ready to serve to keep it firm. the only thing i changed was syrup to honey as that’s the only syrup i had yesterday. I refrigerated it the whole night and still rather runny ?, is it maybe because of honey? The honey was a thick one though ? Any ideas how to thicken it up with extra ingredients maybe shortening? So it’ll last longer in room temp? Thank you much JJ! Tastes awesome!! Hummm, the honey shouldn’t make a difference as it is pretty much the same as other syrups. Did you use a classic coconut oil that sets hard at cooler room temps? If it was a coconut oil that’s always liquid that is definitely the issue as the coconut oil is what hardens on refrigeration. The other issue may have been too much liquid in your steamed cauliflower but it still shouldn’t be runny. Or an accidental mis-measurment on the lemon juice (more than 1/4 cup) or coconut oil (less than 1/4 cup)? Adding more coconut oil (if it’s the right kind) will help it set. Yes, shorting will do the same thing and in theory will keep it firmer at room temp. 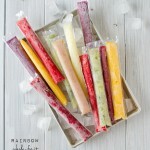 If using shortening, melt it, blend in to fully incorporate then refrigerate again to harden.